This is one of my favorite foods from Phuket. It is one of friend’s family recipe. We can have these stink beans any where across the country. Stink beans are also available in some Asian Shops in Europe. Despite its peculiar smell, they are believed to have many positive health effects. 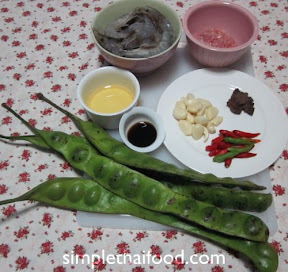 I am the big fan of stink beans, you can eat them raw with chili sauce or shrimp paste. 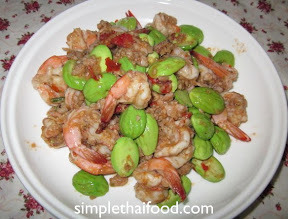 In Southern households, they have all the fresh vegetables including stink beans with chili sauce/shrimp paste. First make the paste by adding garlic, chili and shrimp paste into the mortar and beat into paste. Keep it aside. Heat the oil in the pan in medium heat and add the paste to fry, when start frying add the mince pork, continue frying for a few minute then add the shrimp. Season with Soya Sauce and add the stink bean, fry them shortly together and done! Tips: The Shrimp paste has the saltiness in itself, so watch out for the seasoning; maybe you would not need soya or fish sauce at all. This dish is best when served with hot steam rice. I made this dish yesterday, thanks for the recipe! And good photo’s! It tasted good, I used half the amount of chilis and next time I will use less of the shrimp paste, I think the taste of the shrimp paste was a bit to strong for us. And the soya saus gives a dark color. Next time I will try it this way: 10 chili’s, 1 or 1/2 teaspoon shrimp paste and a bit more fish sauce in stead of the soya sauce to keep the freshness in the color.